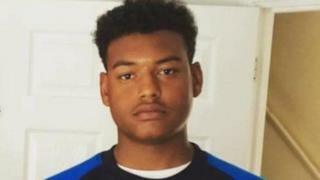 Two men have denied murdering Ipswich teenager Tavis Spencer-Aitkens. Leon Glasgow, 41, of no fixed address, and Adebayo Amusa, 20, of London, pleaded not guilty to murder via video link at Ipswich Crown Court. Isaac Calver, 18, of St Helen's Street in Ipswich, also appeared but did not enter a plea. Two other men and a 16-year-old boy have already denied killing the 17-year-old, who was fatally stabbed on the Nacton estate in June. Mr Glasgow and Mr Calver will appear at the same court again on 21 September together with Mr Amusa, of Sovereign Road in Barking; Callum Plaats, 23, of no fixed address, Aristote Yenge, 23, of Spring Road in Ipswich; and the 16-year-old boy from Colchester, who cannot be named for legal reasons. All six have been charged with one count of murder. A 20-year-old man, arrested on suspicion of conspiracy to murder, is due to answer bail on 4 September.